I don’t care what you say, this looks awesome. I believe my geek circuits have just blown a fuse. What you’re seeing up there is a guy on an omni-directional treadmill called the Virtuix Omni. The goofy thing on his head is the Oculus Rift, which is a very, very promising virtual reality headset. 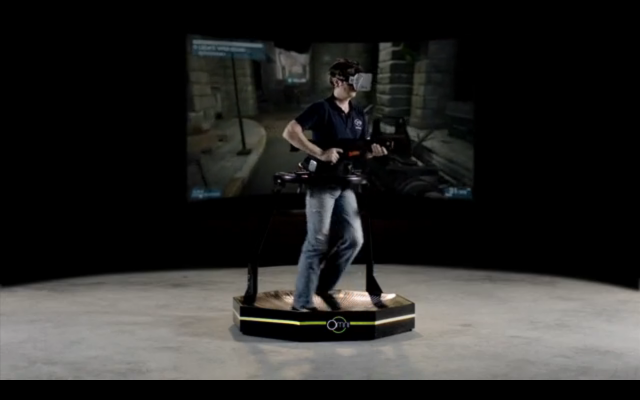 The two are now available for pre-order from Virtuix in a bundle that costs only $500. Actually, it’s $450 is you enter the promo-code, “VR50” when you purchase. Holy crap. I thought that this thing was going to easily cost twice that! Imagine playing Call of Duty whilst getting a killer workout. You can actually run and duck your way through combat without having to wear a Rift around the neighborhood like a lunatic. I’ve dreamed about a setup like this since I was little. I visited a VR arcade on the Atlantic City Boardwalk that worked in a similar fashion. I immediately asked the attended if my parents could buy one to take home (I think I was around 10). He just laughed at me. I still think it was one of the coolest gaming experiences of my life, and now it looks like it’s within reach!